The boat was going only 10 miles per hour when it hit a sandbar, but it was enough to change Tim Dunaway’s life forever. On Easter Sunday 1998 Dunaway was driving family members on his boat on the Pearl River Navigation Canal near his home in Louisiana’s St. Tammany Parish when it hit a submerged sandbar, smashing his face into the boat’s aluminum windshield frame. It took a 14-hour surgery and titanium rods to put his face back together. Dunaway was able to return to his job as a registered nurse and clinical exercise physiologist, but 18 months later infection set in. Doctors had to remove his nose, leaving him permanently disfigured, disabled and despondent. He isolated himself, preferring to spend time roaming a local wildlife refuge with his German shepherd rather than dealing with people staring at him. Then his sister saw prosthetic specialist Robert Barron on “The Oprah Winfrey Show.” A 24-year veteran disguise master for the CIA, Barron, 73, retired in 1993 to start his own business, Ashburn-based Custom Prosthetic Designs Inc., where he makes advanced, handcrafted prosthetics for patients from around the world, helping cancer survivors, accident victims and people with birth defects. Barron has been featured in publications such as The Washington Post and Reader’s Digest as well as various television programs ranging from the “CBS Evening News” to “The Montel Williams Show.” Some of his high-profile clients include 9/11 Pentagon attack survivor Louise Kurtz, for whom he made a pair of prosthetic silicone ears. “Just as my disguises worked, my success today depends on realism, perfection and the ability to stand up to close scrutiny. Prosthetic devices dramatically increase the quality of life,” says Barron, a gregarious, loquacious grandfather of two, with kindly eyes, a thick mustache and a head of shaggy gray hair. “Everything has to be as realistic as you can possibly make it. In the agency those [prosthetics and] masks had to pass the closest scrutiny at six to 12 inches, and, if not, you may not make it back. Their lives were in jeopardy if that mask attracted attention in a negative way,” Barron says. Barron, who doesn’t hold a medical degree, makes a range of facial prosthetics, many of which are covered by medical insurance. “These are medical necessities,” Barron says. Prices vary depending on the complexity of the item being crafted. The disembodied ears, eyes and mouths sitting around Barron’s workshop are all eerily realistic. 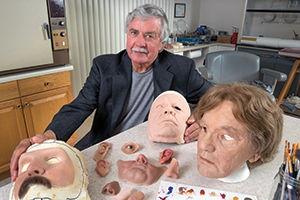 Barron molds or sculpts the parts from silicone, making molds from patients’ body parts and working from photos. His prosthetics include multiple translucent and opaque layers, just like real skin. He adds pores with toothpicks and hand-paints each prosthetic to match the patient’s skin tones and natural complexion and blemishes. Barron takes pleasure in recounting the story of a patient who had to come back for a fix after his barber trimmed the hair in his new prosthetic ear. Barron also made a prosthetic ear for Kristen Bauer, a 25-year-old nursing student from Gering, Neb., who was born with microtia, a birth deformity in which an ear doesn’t form properly. Bauer had childhood surgeries to reconstruct her right ear, but the result didn’t look like a natural human ear. Barron isn’t allowed to discuss much about his work for the CIA, which took him around the world and stretched from the Vietnam War to Operation Desert Storm. He worked very closely with legendary Hollywood makeup artist and CIA contractor John Chambers, famous for his work on the original “Planet of the Apes” films. A U.S. Marine Corps veteran who later worked at the Pentagon as an art director for naval fleet magazines, Barron was brought to the CIA’s attention after he reproduced a Pentagon parking pass so he could park closer to the building in inclement weather. The CIA recruited him into its Office of Technical Services, Graphics and Identity Transformation Group in 1968. He started out forging documents for the CIA and later moved into disguise, working on everything from crafting new identities to creating doppelgängers.